Through these partnerships, parents and caregivers enhance their leadership skills, increase their knowledge about children’s needs, and develop relationships with others so that they can be a voice for change and take action. Anyone who believes in our goal can join a Community Partnership, and our membership continues to grow each year. You can learn more here. Below is a roundup of some of the most recent activities and events undertaken in Best Start communities. More than 75 local residents – many of them parents and their children – recently completed a 5K run/walk that took place on two major streets in Compton and along the Compton Creek as part of a Best Start Compton/East Compton-sponsored event to raise awareness about the importance of health and exercise. 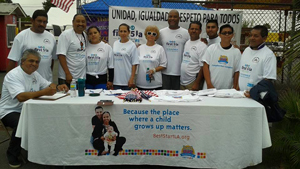 “I brought my family – especially my girls – to come and walk for a healthy, better life,” Best Start Partnership member Maritza Delgado said of the Sacred Heart 5K Run/Walk and Health Fair held last month. “People were honking their horns to motivate us,” said lifelong Compton resident Jorge Ramirez. The health fair featured booths from agencies like Kaiser Permanente, which offered blood screening for diabetes, and testing for high blood pressure and cholesterol. The event was supported by local non-profit Social Justice in Community Action and co-sponsored by El Nido Family Centers. “I like the way we’re working together to build a better community,” said Delgado, highlighting the importance of Best Start’s community capacity building efforts. 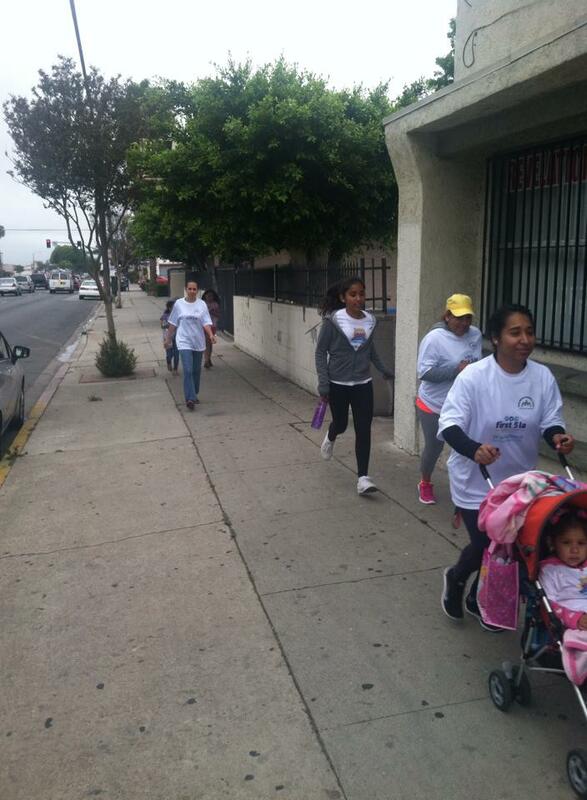 The event also reflected First 5 LA’s emphasis that children are born healthy and maintain a healthy weight by encouraging families to stay active and participate in a regular exercise program. Nestled in between Long Beach and San Pedro, in the heart of the harbor, lies the community of Wilmington. There, where they receive imports from across the world, the hustle and bustle of nearby refineries and trucks can be heard. So when Best Start Wilmington recently decided to participate in the annual Sharefest Workday, a community-building and service day held to mobilize volunteers of all ages to work on community projects, parents and community organizations quickly got to work. Together with I Heart Wilmington, which is run by the South Bay Center for Community Development, they started to generate ideas of what they wanted to contribute and change in their community. “We started with a conversation about our local alleys. We focused on one near our center. This alley is used as a shortcut by the community, but they find themselves not wanting to pass through it because it doesn’t feel safe. There is a lot of trash, drug paraphernalia and homelessness,” said Diana Medel, Best Start community member and lead for I Heart Wilmington. 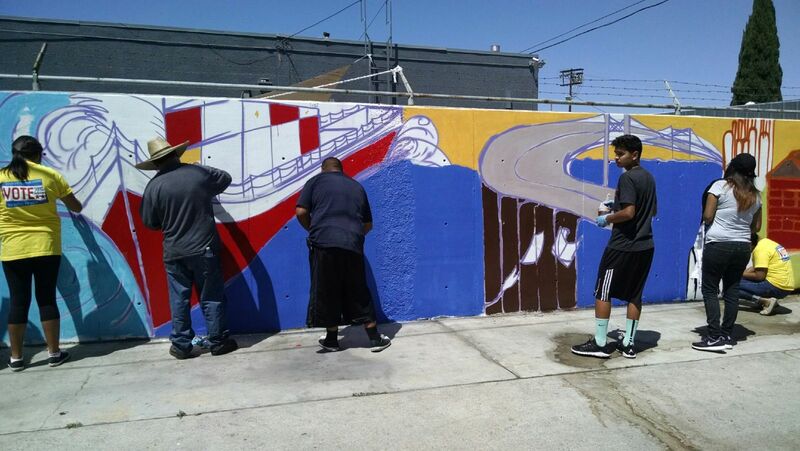 It was then that they decided that, along with local talented artists, they would design and paint a mural in the alley, titled Cultural Roots: Pathways to CommUNITY. 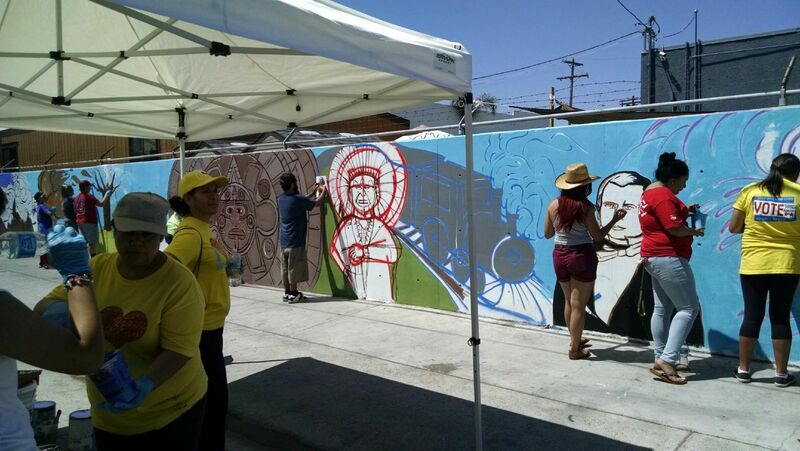 Together, the community and local artists began the mural by creating a timeline of the rich history in the community. “We wanted a representation of our culture with vivid colors that people would enjoy. There’s an Aztec calendar, a pyramid, a train and a boat. Then we started adding ports and a really nice bridge, as a sign of the community moving forward. There’s a school building and important figures in our culture and community, like Dolores Huerta, Cesar Chavez, and the founder of Wilmington, Phineas Banning,” said Medel. More than 30 people participated in painting the mural in the alley, located between the streets of Avalon and Marine, for seven hours. During that time, many surrounding neighbors and businesspeople came out to show their support, thanking the group and bringing them small gifts and drinks.